Lull mattress guarantees satisfaction. They offer a risk-free trial of 100 nights to sleep on your brand-new bed before you have to commit. Lull mattress also advertises that customers save up to 75% on their chosen mattress in comparison to retailers. Three layers make up their mattresses: the comfort layer (one and a half inches of gel-infused viscoelastic memory foam, the middle or “transition” layer which is one and a half inches of latex-like foam, and last but not least the support layer consisting of seven inches of core polyurethane foam. They offer beds that work with all bed frames: flat platform, adjustable, slatted base, box springs and for the floor. Their Lull-Ultra-Premium mattress is sold exclusively online; they also offer discounts for signing up for their e-mail list. 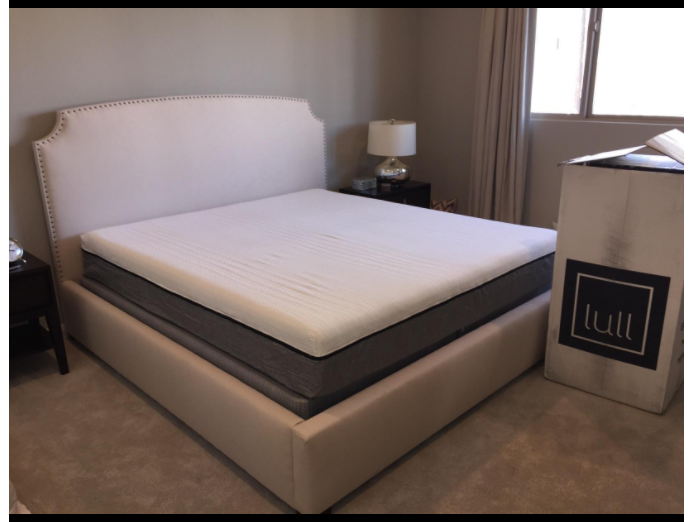 Last, but not least, Lull mattress also states that they have a 95% customer satisfaction rate and provides a like from their website to customer comments as it relates to their satisfaction rates. Lull mattress ships directly to your home; this saves time and money, allowing Lull to put more time and money into mattress production. According to one customer review, you can sleep in ALL positions on the mattress i.e. back, side, and stomach; in comparison, other mattresses seem to only work for one or two positions. If you like the memory foam feeling, and actually “sinking’ into bed, then you will love the Lull mattress. If you are pregnant, suffering from a back injury, or have back pain, the mattress is also firm and is made for support; the high qualify foams will address the pain giving the care where needed. Once customer stated that the Lull mattresses feel as if the memory foam is of a higher quality than most other latex mattresses. If you like a lot of “bounce”, this foam mattress will not provide that; the second layer of foam-like latex prevents any “spring” to the mattress. The foam layer makes you feel as if you are actually laying in the bed. There is no way to try out the mattress; all mattresses are bought and sold online. So unlike stores, you are not able to test the product prior to purchase. One customer compared the firmness of the mattress to the Tempur-Contour Rhapsody Luxe edition. **hint – maybe a way to try it out in stores! Go check stores near you! Another customer stated that she can feel her husband move even though the advertisement said that she should not be able to feel him move; however, she is so happy with the mattress, this does not bother her. With all products, there are pros and cons. With Lull mattresses, it appears the pros outweigh the cons. Every website checks out over a 4.5-star rating. All of the pros and cons also seem to be similar. What are you waiting for? It may be time to order that new 10’’ Lull mattress!